Please be advised that we will only stock the Security Package Version of this harness. Features: Reversible harness incl. 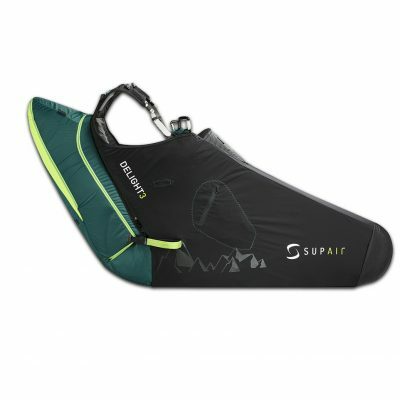 carabiners, comfortable rucksack waist strap and useful front pocket on the chest strap, with Airbag, reserve container (not including reserve) and V-connection.Very straightforward, double the comfort – and light.This EASINESS 2 light reversible harness with no seatboard literally sparkles with many new features. A range of two sizes will suit every individual, wider shoulder straps and longer legpads ensure even more comfort, and a removable airbag with built-in reserve compartment guarantee maximal safety. The rucksack mode is not just ultra-comfortable to carry, but serves as a genuine mountain backpack, fitted with removable waist strap, helmet net, pole and ice axe holders. It’s not just the airbag, with its built-in reserve – the whole harness is multi-functional. This applies whether for Hike & Fly, travelling, fly-bivouac or leisure fun: a modular system invites the pilot to decide on his intended use, and therefore always the weight he wishes to carry. He can choose between an Ultralight Package, Comfort Package and Security Package – maximum flexibility. Which pilots and uses is the EASINESS 2 suitable for? 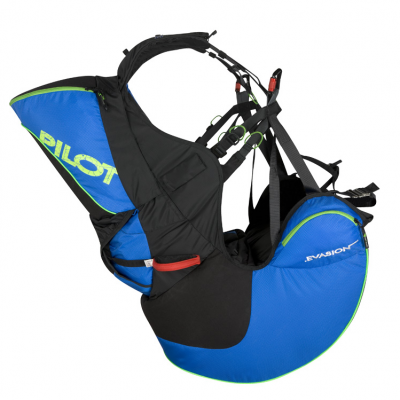 The EASINESS 2 is a very light and comfortable reversible harness from 1.47 kg, that, among other things, boasts very good carrying comfort both in flight and when carried as a rucksack. Its light weight makes it exceptionally suited to Hike & Fly and Bivouac flying because the rucksack has 14% more volume than the original EASINESS. Travellers and leisure pilots who value compact equipment, high flying comfort and extra features – like an instrument cockpit – will find the EASINESS 2 exactly what they are looking for. 3-D development technology makes extensive thermal flying a possibility. Can I only pack a light wing in an EASINESS 2? No. Size M carries 49 litres and size L 57 litres in its rucksack. There’s room for a standard fabric paraglider inside, provided it’s folded carefully. More volume is available outside the rucksack with a helmet holder and various other fastening possibilities – so the rucksack has plenty of space all round. Can I use the EASINESS 2 without a reserve, or with a front container? Yes. The EASINESS 2 can be flown with or without its airbag, or without a reserve in the airbag/integrated reserve compartment under the seat. The reserve compartment is then closed by a couple of yellow cable blanks – supplied. The LTF-approved airbag functions normally with or without the reserve. An EASINESS 2 front container is available as an option. It comes with a reserve handle and reserve connection. 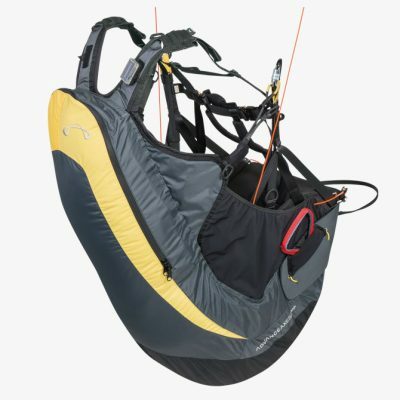 The front reserve can be connected to the shoulder supports as well as to the light harness main carabiners. It is also possible to use a steerable (Rogallo) reserve. There’s a tidy stowage for the steerable’s brake handles in a Velcro-secured tube on top of the V-connection channel. What is new for the EASINESS 2, compared with the EASINESS? The EASINESS 2 comes in two sizes. S/M is for pilots between 155 and 185 cm tall, size L is for heights of 175 and 202 cm. In between, where either size might suit, pilots have the choice of lower hang points (smaller size) – for more dynamic handling, or the higher hang points of the larger size – for a more damped glider reaction. How is the optional, LTF-certified airbag fixed? Can you take it off? The airbag with its integrated reserve compartment fixes under the harness with one zip and six “Bullet Toggles” through loops. The end of the zip is secured with a ball and loop. The airbag is easy to remove. Is the EASINESS 2 suitable for tandem flying?